Creamy Red Pepper Marinara Dip: The ceramic skillet is filled with tangy sauce, then topped with melted mozzarella cheese and served with toasted baguette slices. You can even add crumbled meatballs or Italian sausage, which is exactly what I will be doing on my next visit. Bacon Balsamic Deviled Eggs: Take your traditional deviled egg, then top it with bacon pieces and balsamic glaze for a new twist on an old favorite. Meatball Sliders: A fresh, sourdough bun, with a hearty meatball, topped with mozzarella and just a splash of marinara sauce. 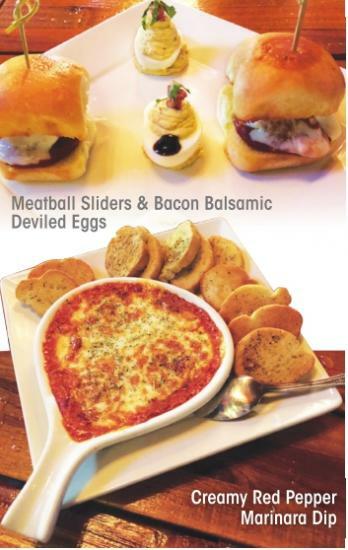 Even though this is from the Shareables section of the menu, if you order these, you won't want to share them. Tuscan Herb Cobb: Romaine lettuce, red onions, cherry tomatoes, egg, bleu cheese, grilled chicken, crispy bacon with a Tuscan herb vinaigrette dressing. Thank goodness there were three of us there eating because, along with everything else we’d sampled, we wouldn’t have made a dent in this salad. 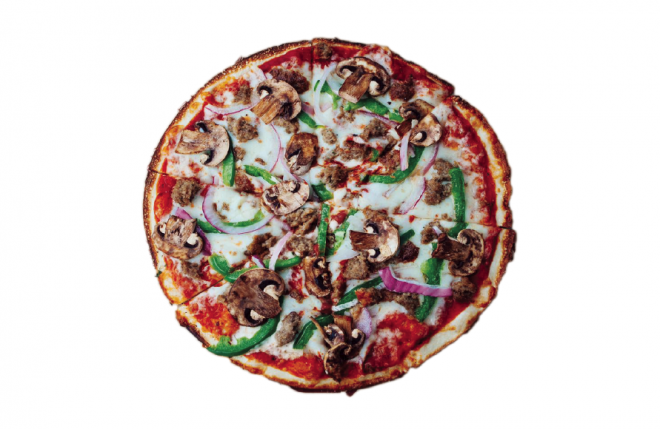 Build Your Own Pizza: There are several already-crafted pizza selections on the menu, but the fun part about this place is that you can build your own pizza and it’s still one price. Want just cheese and pepperoni? Not a problem. Want a mozzarella and bleu cheese pizza with grilled chicken, smoked ham, anchovies, sweet fennel sausage, sun-dried tomatoes, pineapple, artichoke hearts and pepperoncini? Also not a problem. It’s like Subway but with pizza. And you can build your own salad, too. They even have finishing sauces that are drizzled on top. We went with a more simple pizza with thin crust, white sauce, feta and mozzarella cheeses, pepperoni and hamburger, topped with basil pesto finishing sauce. It was superb! Oreo Dessert Pizza: You had me at Oreo. They take a pizza crust and top it with crumbled Oreo cookies, then drizzle caramel on top and finish with some powdered sugar. The best dessert pizza I’ve had, and I try every dessert pizza I ever come across. This is perfect for sharing with the table. Montrosé Cocktail: House-infused strawberry mint Tito’s vodka, Pamplemousse liqueur, lemon-lime soda, fresh mint and strawberries, topped with an upside-down mini-bottle of Lunette Rosé. My date loved it. Old Jackson Mule: I love a good Moscow Mule, and this is a great variation on the drink: Cathead honeysuckle vodka, ginger beer, fresh mint and lime, served in a big Solo-style copper cup. BBQ Chicken: Sweet & bold BBQ sauce, mozzarella, grilled chicken and red onions. Oreo Dessert Pizza: Can you ever go wrong with Oreo? Mediterranean Salad: Romaine lettuce, pepperoncinis, black olives, artichoke hearts, sun-dried tomatoes, feta, with basil balsamic dressing. Rev’d Up Meat & Peppers: I’ll be pairing the Mediterranean salad with this pizza: olive oil, mozzarella, Italian sausage, beef meatballs and jalapenos. $1 off mixed drinks & wines by the glass. There’s even a collection of tallboys that are always $2.